One week after even the IMF joined the chorus of warnings sounding the alarm over the unconstrained, unregulated growth of leveraged loans, and which as of November included the Fed, BIS, JPMorgan, Guggenheim, Jeff Gundlach, Howard Marks and countless others, we reported that investors had finally also joined the bandwagon and are now fleeing an ETF tracking an index of low-grade debt as credit spreads blow out and cracks appeared across virtually all credit products. Specifically, we noted that not only had the $6.4 billion Invesco BKLN Senior Loan ETF seen seven straight days of outflows to close out November, with investors pulling $129 million in one day alone and reducing the fund’s assets by 2% to the lowest level in more than two years, but over 800 million has been pulled in last current month, the biggest monthly outflow ever as investors are packing it in. Fast forward to today, when another major loan ETF, the Blackstone $2.9BN leverage-loan ETF, SRLN, just suffered its largest ever one-day outflow since its 2013 inception. Year to date, the shares of this ETF backed by the risky debt have dropped 2.6%, hitting their lowest level since February 2016; the ETF's underlying benchmark, the S&P/LSTA Leveraged Loan Index, has also been hit recently and is down 2.3% YTD, effectively wiping out all the cash interest carry generated YTD and then some. "The price action in the ETF hasn’t warranted investors to justify keeping it on to collect the monthly coupon it pays," said Mohit Bajaj, director of exchange-traded funds at WallachBeth Capital. "The risk/reward hasn’t been there compared to short-term treasury products like JPST," he added, referring to the $4.2 billion JPMorgan Ultra-Short Income ETF, which hasn’t seen a daily outflow since April 9. Couletsis pointed to widening credit spreads and the fact that loan ETFs have floating-rate underlying instruments, assets that become less attractive than fixed-rate ones should the Fed skip its March rate hike, which after Powell's latest dovish turn and today's weak payrolls may - or may not - happen. The ongoing loan ETF puke comes at a time when both US investment grade and junk bond spreads have blown out, while yields spiked to a 30-month high this month. In November, investment grade bonds suffered their worst year in terms of total returns since 2008 and December isn't looking much better. Meanwhile in high yield, junk bonds yields just had their biggest one-day jump since April. BLKN and SRLN aren't alone: investors have pulled over $4 billion from leveraged loan funds in the three weeks ended Dec. 5, the largest cash bleed in almost four years for such a period, according to Lipper data. According to a note from Citi strategists Michael Anderson and Philip Dobrinov, leveraged loans in the U.S. may no longer be the “star performer” amid a potential pause in rate hikes by the Fed, while the recent redemption scramble has caused ETFs to offload better quality loans to raise cash, according to the Citi duo. That’s despite leveraged loan issuance being at its highest since 2008 largely as a result of insatiable CLO demand. Incidentally the behavior described by Citi's strategists, in which ETF administrators first sell high quality paper then shift to deep discount holdings, was one of the catalysts that hedge fund manager Adam Schwartz listed three weeks ago as a necessary condition for credit ETFs to enter a "death spiral." And with virtually everyone - including the Fed, BIS and IMF - all warning that the next crisis will begin in the leverage loan sector, the question to ask is "has it begun"? One answer comes from the primary market, and it hardly reassuring. As we discussed last week, while the leveraged-loan party isn’t quite over, jitters around the world have made lenders and investors less willing to give loans to heavily indebted companies, with numerous loan offerings getting pulled and lenders are demanding - and getting - sweeter terms. As Bloomberg reports, on Tuesday JPMorgan had to slash the price on a $210 million loan to 93 cents on the dollar from par to sweeten investor demand and help finance a private jet takeover. Specifically, JPMorgan offloaded loans financing the takeover of XOJET at 93 cents on the dollar, one of the steepest discounts seen in the leveraged loan market this year. And with the market on the verge of freezing, the size of the deal was cut by $70 million from the originally targeted amount. In Europe, the market appears to have already locked up, as three loans were scrapped over the last two weeks, victims of the Brexit tensions gripping the UK. To wit, movie theater chain Vue International withdrew a 833 million pound-equivalent ($1.07 billion) loan sale. While the deal was meant to mostly refinance existing debt, around 100 million pounds was underwritten to finance the company’s acquisition of German group CineStar. Last week more deals were pulled when diversified manufacturer Jason Inc. became at least the fourth issuer to scrap a U.S. leveraged loan. Additionally, Perimeter Solutions also pulled its repricing attempt, Ta Chen International scrapped a $250MM term loan set to finance the company’s purchase of a rolling mill, and Algoma Steel withdrew its $300m exit financing. Global University System in November also dropped its dollar repricing. Fears of a slowing global economic growth even as rates continue to rise, combined with anxiety over trade talks between the U.S. and China, reluctance to take risk before year end and the recent rout in credit products, have all led to a widespread fear across markets; investors are also concerned about higher interest rates weighing on corporate profits. These fears are spreading across credit markets, from investment-grade debt to junk bonds. “No one thinks this is the big one," said Richard Farley, chair of the leveraged finance group at Kramer Levin told Bloomberg. "But on the fear to greed continuum we have definitely moved closer to fear." The fear has resulted in the S&P/LSTA leverage loan price index tumbling to a two year low. The sharp shift in sentiment has been remarkable: for most of 2018, investors couldn't get enough of floating-rate products like leveraged loans based on the assumption that they will fare better in a rising-rate environment. As a result of blistering demand, companies were able to sell new debt with virtually no covenant protections and higher leverage, triggering warnings about deteriorating standards from regulators and bond graders in recent months (see above). 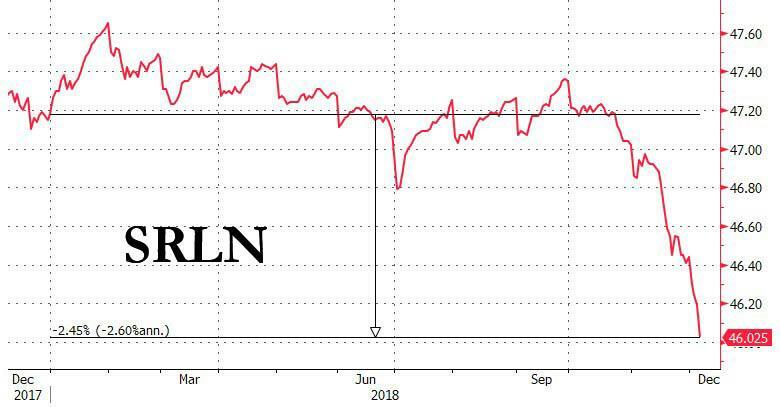 And, in the aftermath of Chair Powell infamous Oct 3 speech which sent risk assets tumbling and tightened financial conditions, leveraged loan price indexes in Europe and the U.S. have dropped to their lowest level in over two years, while nearly all of the loans outstanding are now trading below their face value. According to JPM, the percentage of loans trading above face value has dropped to just 3.9%, a 29-month low, down from 65.4% in early October. This suggests that virtually all leverage loan investors are now underwater on a total return basis. Still, optimists remain: "The downdraft in loans has been very orderly thus far," said Chris Mawn, head of the corporate loan business at investment manager CarVal Investors. "We anticipate most managers will keep buying in this market trying to be opportunistic and those who don’t have to sell will just hold."